Our new powerglide transbrake valve bodies are now available online. BTE 228260, 248260, and 228270 are now in the online store. These are made from 100% new castings, valves, and include a new solenoid. This new casting design is refined specifically for racing. BTE's powerglide accessory and assembly kit includes many of the harder to find components required to building a powerglide transmission. Springs, pistons, snap rings, shift linkage, and fasteners are included, as well as a new, two ring servo, servo cover, and high performance servo spring. Visit our website at www.bteracing.com to order yours today! You can now find information about our Contingency Program on our website at www.bteracing.com. We recently celebrated our 20th Anniversary by hosting our first ever Open House. When the idea first came about, we weren't sure how many of our customers would like to spend a Saturday with us and peek inside our “Big Blue Building”. However, we were thrilled with the amount of participants that we had register. Our final registration number was over 250 and we had people come from all over the Mid-South, as well as Louisiana, Kentucky, and New York. 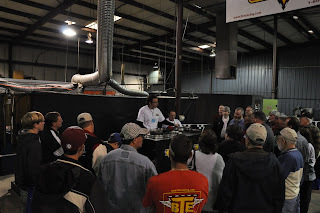 During the Open House, guests were able for the first time to tour our facilities and watch two seminars hosted by Brandon Barrentine. He gave presentations on our Transmission and Torque Converter Departments. Guests who visited were also able to speak directly with representatives from some of our most popular brands: John Larkin from Red Horse Plumbing and Hedman Hedders. Chuck Schwam from Joe Gibbs, Autometer, Ram Clutches, and Moroso. Larry Dalgo from Mr. Gasket and PRW. T.J. Tracy from Motorvation. In the last hour of the Open House, we gave away t-shirts, hats, diecast cars, a MSD Ignition system, Joe Gibbs Racing Oil, an Automoter Tachometer, a flat screen television, travel luggage, a BTE Torque Converter, and a BTE Transmission. Also, we were able to give away gift certificates from Holly Springs Motor Sports, Eagle Racing Engines, Digital Delay, Huntsville Engines, and Coalberg Production's World Footbrake Challenge. 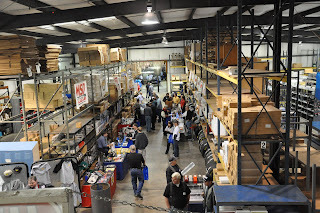 Hosting our first Open House was a great way to give back to the customers that have been supporting us over the last 20 years and a hands-on introduction to those who are just getting to know us. Thank you to everyone who attended and who participated!